Some people may think of eye cream as just moisturizer in a smaller tube but that couldn’t be farther from the truth. Eye cream should be an essential part of any beauty tool kit, whether your skin is dry, sensitive or oily, and whether you’re in your 20s or enjoying your 50s. Selecting the right under eye cream and incorporating it into your daily routine helps prevent eye wrinkles from forming, and also treats any fine lines that you may have. But not all eye creams are created equally. If you already use a day cream, night cream and a serum, you may hesitate to buy another hyper specific beauty product. But eye creams are formulated differently to facial moisturizers, as the skin around the eyes is thinner and more delicate than the face. By some estimates, the skin around the eyes is 40 percent thinner than the rest of the face. This area is also highly prone to showing the signs of aging first, as the eye area skin tends to be dry and thin. The thinner skin in the eye area also absorbs products very quickly, so the formulas need to address that. Think about it another way- would you use soap to remove your eye makeup, or a specially formulated product that won’t irritate the delicate eye area or sting your eyes? The holy grail of eye creams is one that provides a dollop of moisture without being too heavy or greasy. While mature skin may appreciate a thick formula, using a too-rich formula on younger skin can cause makeup to slide right off. 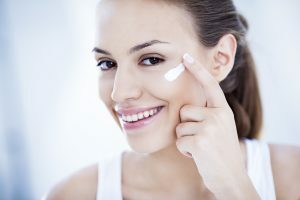 No matter how old (or young) you are, it’s important to use a daily eye cream to keep this area well nourished – after all, dry skin tends to show wrinkles faster. And if you are already seeing fine lines appear, a wrinkle fighting eye cream is a must. Take a look at our picks for the best anti-aging eye creams. Which Eye Cream Should I Use? With so many eye creams on the market, it can be tough to narrow down the right one for you. One way to whittle down the field is to think about what eye area concerns you may have – is it hydration, fine lines, dark circles, puffiness, or some combination of all of these, depending on the day? Or maybe you have sensitive skin, or are looking for an affordable eye cream that contains super brightening powers. Today’s innovative formulas can do everything from soothe itchy eyes to eliminate puffiness, along with fading dark circles. Try to find a formula with a high SPF to help protect the delicate eye area from the sun’s damaging rays as well. Your eye cream needs may also change with the seasons, where dry eyes need a rich formula in the winter but you may need to switch to a lightweight gel in the warmer, humid summer months. Eye treatments come in three different basic types of formulas- gels, creams and serums. The right one for you may be a matter of personal preference. Tap some on gently and see how it feels. There is always a bit of trial and error involved when trying any new skincare product. It can take a few weeks to see how a product reacts with your skin or if your new eye cream makes your eye makeup crease and smear. Some formulas layer well under concealer while others do not. Eye cream should be applied twice a day, in the morning and in the night. If your eyes aren’t too dry, you may opt for a lightweight gel or serum during the day and switch to a thicker eye cream at night- perhaps one that is formulated to tackle the signs of aging. Always apply eye cream in a gentle tapping motion, preferably using your pinkie (or index finger, as long as its clean). Eye creams should be applied below the eye, around the crow’s feet area and the browbone area just below your eyebrows. You may want to avoid applying eye creams with active ingredients (such as retinols) to the upper eyelid, as it could cause irritation. If you’re worried about pulling and tugging on the skin, try an eye cream with a metal applicator tip. The metal has an instant cooling effect on the skin. For extra “chill” to help with depuffing tired eyes, try storing your eye cream in the fridge. What Ingredients are in the Best Eye Creams? To help narrow down your hunt for “the one,” it’s helpful to think about what you’re asking your eye cream to do for you – and then read the label carefully. The main role of an eye cream is to hydrate the skin and protect this delicate area. Look for products containing moisturizing hyaluronic acid, which hydrates the skin and give it a smoother appearance by filling in fine lines. Hyaluronic acid is an all-around superstar as it holds up to 1,000 times its weight in water and acts like a moisture magnet, by drawing water to itself. Ceramides also help boost hydration, along with oils and glycerin. Vitamin A derived retinol is a key wrinkle fighter. It helps encourage cell turnover to reveal fresher, smoother looking skin. Retinol can also help fade dark spots and discoloration. Other vitamins to look out for include vitamins C and E- these powerful antioxidants help give skin a glow and boost skin elasticity while soothing the skin. Anyone with sensitive skin may prefer an eye cream with neuropeptides. It works similarly to retinol but can be less irritating to the skin. Here’s a look at some of the best eye creams of 2019. This eye cream truly does a little bit of everything. The tinted formula helps minimize dark circles, and the gel-like texture glides on easily and feels cool and light. Olay’s Ultimate Eye Cream absorbs quickly into the skin and leaves the eye area looking brighter and more refreshed. The formula is also fragrance free. Reach for this slim tube if you want to give laugh lines and crow’s feet a one-two punch. Roc’s formula contains wrinkle busting retinol but the cream is gentle enough to be used twice a day. An infusion of zinc, copper, and magnesium work to increase cell turnover. When your tired eyes could use a little zing and a pick me up, apply a thin layer of this cream from Origins. True to its name, GinZing Eye Cream is packed with ginseng root extract and caffeine, which help to reduce puffiness. Shea butter adds a dose of moisture while mica helps reflect light- and smooth out any fine lines. Like all La Mer products, this eye cream harness the power of Miracle Broth, a special blend of algae that is meant to work wonders on all skin ailments. This eye cream helps to improve the appearance of dark circles and fine lines thanks to the mineral hematite, while adding a heavy dose of moisture. This cult favorite eye cream is lightweight and feels refreshing, and is constantly referred to as “eight hours of sleep in a jar.” The gel-like formula works overtime to reduce puffiness while targeting dark circles, leaving skin with a refreshing glow. Avocado is showing up in more places than just your toast. The nutrient rich oil from an avocado is the star ingredient in Kiehl’s eye cream. Rounding out this creamy, nourishing formula is the antioxidant beta-carotene, along with rich, soothing shea butter. SK-II’s knockout eye cream features a lightweight but silky texture which helps to minimize the appearance of fine lines. The velvety formula also works on dark circles and helps boost firmness. The eye cream can be used twice daily. It’s hard to resist the sleek black packaging of Chanel Le Lift Eye Cream but it’s more than just a pretty jar in your bathroom. This powerhouse formula is a cream-gel hybrid packed with 3.5-DA, which is extracted from the edulis plant, an antioxidant that is also thought to have anti-inflammatory properties. The result? A pretty potent eye cream that firms skin, reduces puffiness and soothes the eye area. Gently pat on Advanced Dermatology’s Youthful Boost Eye Cream to give your eyes a refreshed, youthful look. The lightweight formula is an all-around superstar as it helps reduce the appearance of dark circles, fine lines and tired looking eyes, while delivering plenty of hydration. In other words, it’s everything you need from your eye cream. This paraben free eye cream works for all skin types and is packed with plenty of good-for-you ingredients including peptides, antioxidants and skin plumping hyaluronic acid. The formula tackles dark circle and puffiness to help you look more awake and refreshed. Estee Lauder’s Advanced Night Repair range is a classic, and the peach hued gel formula helps to keep the eye area hydrated while also working on improving the appearance of dark circles, fine lines and puffiness. The formula is fueled by hyaluronic acid and also helps brighten the eye area. Puffiness and dark circles are no match for this eye cream from Formulyst. The cream taps into the power of vitamins, amino acids and minerals, and contains three naturally-derived ingredients – chenopodium quinoa seed extract, caffeine and butchers broom extract. These powerhouse work together to help leave the delicate eye area looking smoother and brighter. Formulyst’s Complete Anti-Aging Eye Cream is a multi-tasking formula targeting the various signs of aging around the eyes. The powerful cream contains retinyl complex and peptide technology to help reduce the appearance of fine lines and wrinkles, while hyaluronic acid and cucumber extract soothe and hydrate the delicate eye area.